I love the Nativity Story. Even some non-Christians get all teary eyed hearing the Christmas story. There is something about God in the form of a helpless baby, born in a barn and cradled in a feed trough that can touch even the hardest heart. 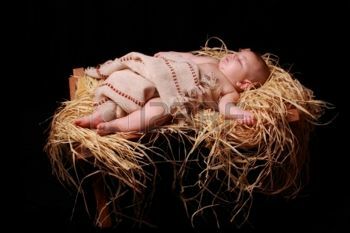 Immanuel, God with us, wrapped in swaddling clothes and lying in a manger. The Word made flesh, born to a virgin, come to save the world. A powerful story. But only the first chapter. There is so much more. We can not leave Him in the manger. Hollywood loves to mock Christians. One way they have done this is showing less-than-spiritual, half-crazy characters praying to and praising “baby Jesus.” Myself, I find that rather offensive. Not humorous. I pray and praise not that small bundle of hope that brought God’s love to earth so long ago, but to a risen Savior who defeated death, hell and the grave. I have fellowship with and am in relationship with The Creator of the Universe who sits on His throne of Power in Heaven. Jesus in the Manger didn’t destroy the works of the enemy. He didn’t shed His blood in humiliation and submission. Jesus in the manger can’t cleanse us of our sins. We have to see Him for who He really is. He is King of Kings and Lord of Lords. He is full of power and authority. Jesus in the manger touches our hearts. But Jesus on His throne changes our hearts. Having said all of that, enjoy the Christmas plays, “Away in the Manger” and all the things that makes Christmas special. But remember what He has done and who He is. Get to know Him now. Have a blessed Christmas everyone!